Microsoft has removed DVD player support ever since Windows 8, yet Apple has dropped DVD media playback on the latest Mac computers. So, to play DVD movies on Windows PC/Mac, you gonna help from a third party DVD video players (Review: Top 5 DVD Player Software). Luckily, in this article, we will quickly walk you through how to play DVD movies on Windows PC/Mac with the best DVD player software. Brorsoft Player is one of the best DVD video player software with recording fuction for your Windows PC and Mac. It's up-to-date to play 4K UHD and HEVC/H.265 content, Blu-ray/DVD, as well as 8K/4K/HD videos in MKV, MP4, MOV, AVI, WMV, etc formats on your Windows PC and Mac in sharper and vivid effect. --Play 4K/1080P Blu-ray/DVD discs in high definition with DTS-HD Master Audio or Dolby TrueHD. --Get sharper, vivid effect to play 4K H.265/HEVC videos on PC/Mac. --Select any period of times and make animated GIF file for sharing to have more fun. --Take snapshot of the shining moment of your movies. --Record what's happening on the screen as a straightforward video. It saves time and is quite effective. --Add a bookmark of the video for watching later or return to recent viewed point as you like. -- 100% clean, no spyware, no ads and no user tracking. VLC is a free multimedia player that supports a wide range of formats including DVD, VCD, H.264, MKV, MP4, MOV, WMV, FLV, etc without the need of codec packs. 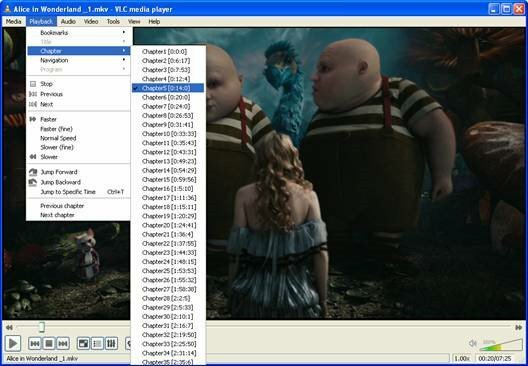 To play DVDs with VLC on Windows PC/Mac, you can set it to automatically when a DVD is inserted by choosing the “Play DVD movie VideoLAN VLC media player” option. However, we also find that many VLC DVD playback errors on Windows 10/8/7 are posted online. RealPlayer is an open source media player that supports multimedia content including: DVD, VCD, MPG, AVI, WMV, QuickTime MOV, FLV, and more. It's the ideal tool for the consumer who wants web video entertainment, but doesn’t want to sift through thousands of videos to find it. Best of all, once users find the videos they love, they can use the great tools and utilities already within RealPlayer to download, convert, bookmark for later or share them with friends. Here's the tutorial on how to play DVD and Videos with RealPlayer. However, there're still lots of Video, DVD media playback errors with Real Player are showed online. With above comparison, you can choose the desired ones to play DVD/Videos on Windows PC/Mac smoothly. What's worth to say is that the all-in-one Video/Blu-ray/DVD Player is Brorsoft Player.